It’s another milestone issue, so we’re bringing back the “animals wearing party hats” tag. I couldn’t find a picture of Rocket Raccoon wearing a party hat, however. Seems he’s not the type to do something like that. 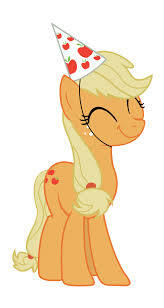 But Applejack is the best pony for wearing hats (in addition to being best pony, period), and her Micro-Series is finally here, so there we go. Also, since this issue number is divisible by ten, there’s another index of previous issues, in case you’ve been looking forward to it. Well, this is a rip-off. After solicits promising us that Neil Gaiman would be involved in this issue, he is credited only as a consultant. Not exactly what I had in mind. I was under the impression he would be doing some writing. I’m not entirely sure what. Like, he’d do a flashback, or something. But no dice. 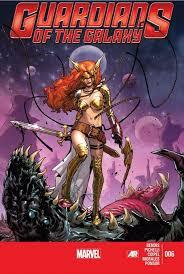 This issue is an extended fight scene between new girl Angela and the rest of the team – but especially Gamora. I guess that’s one advantage of putting the two mysterious warrior women together on one team. Catfights. That’s sexist, probably. Anyway, Uatu the Watcher shows up, which is supposed to mean this is pretty important, except the fight takes place on the Blue Area of the Moon, which is Uatu’s home. It’s not like he’s going to not watch the fight happening in the equivalent of his backyard. Oh, and Groot gets blown up again. Sara Pichelli does most of the art for the issue, and she’s very good at the fight scenes. Her Rocket Raccoon isn’t too bad, but he mostly wears a dorky spacesuit this issue. Olivier Coipel does a couple of pages in which Star Lord talks to Thanos to try and find out what’s going on; since the action of these two artists’ pages are vastly different (fighting versus exposition), the switch is not distracting. In this finale to the two part story “Zen and the Art of Gazebo Repair,” Big Mac is still searching for a nail to fix the Apple family gazebo. During the climax of last issue, the Cutie Mark Crusaders blew up the hardware store; now Big Mac is searching for a pony named Lugnut. Mac continues to wonder throughout the ongoing Summer Wrap-Up fair, being stalked by the Wonderbolt Fleet, who suffered a concussion causing her to fall madly in love with him, because this is a comic about talking ponies and it doesn’t have to make sense. It all leads to a page where Big Mac is mistaken in a fantasy for a James Bond parody, complete with quoted lyrics from “You Only Live Twice” and Ernst Stavro Blofeld in pony form (a white cat cutie mark! Brilliant!). That said, maybe daydreaming about marrying someone like Bond isn’t such a great idea. Anyway, whether or not Big Mac finds a nail is both completely inconsequential and also something I won’t spoil. In the end Big Mac learns a lesson; hell is other ponies, mostly. Dang, this is a kid’s comic? 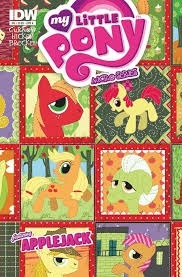 Poor Applejack; of course she’d be featured in the My Little Pony: Micro-Series last. She’s had to deal with that “background pony” joke since season two when her spotlight episode’s summary is “Applejack goes missing” even before an actual background pony stole the spotlight (turnabout being fair play, Applejack hilariously stole the very next episode from the rest of the cast), despite the fact that she’s an apparent orphan who lives on a farm just like every children’s protagonist ever. So, it wasn’t any surprise when solicits promised this issue featured the entire Apple family, not just Applejack. Well, the Apples are featured, but Applejack is still the headliner. When the Sass Squash starts stealing the farm's apples, Applejack decides she must capture it before Hearth’s Warming Eve, Let’s face it, the Apples are the rednecks of the pony world, and nothing says redneck like Bigfoot hunts. Oh, yes, there will be Patterson video references. And Insane Clown Posse lyrics. No, seriously, Apple Bloom spouts some ICP lyrics for no clear reason. I don’t even know how to feel about that. 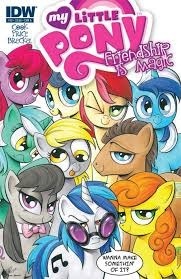 Anyway, this is probably my second favorite of the Mane Six issues, after Rarity’s. Yes, I’m biased for Applejack, but this issue tells a clear story (written by Bobby Curnow) with a definite moral (trust Applejack to remember to write a letter to Celestia); it feels most like an episode of the show. And the Brenda Hickey art is some of the best in the series as well.